Want to learn how to select the best wine for any occasion? This is the course for you. 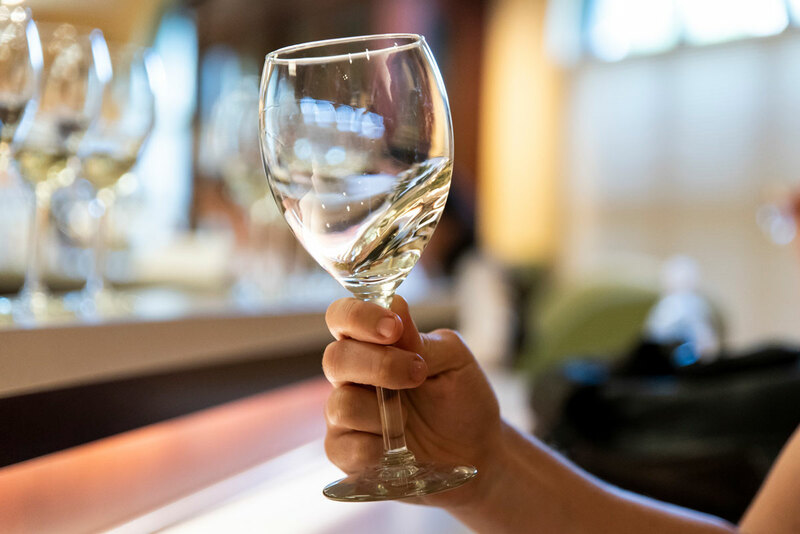 Discover how to use your senses to taste and evaluate wines, while learning about the growing, processing, and production of grape varieties used in making wine. 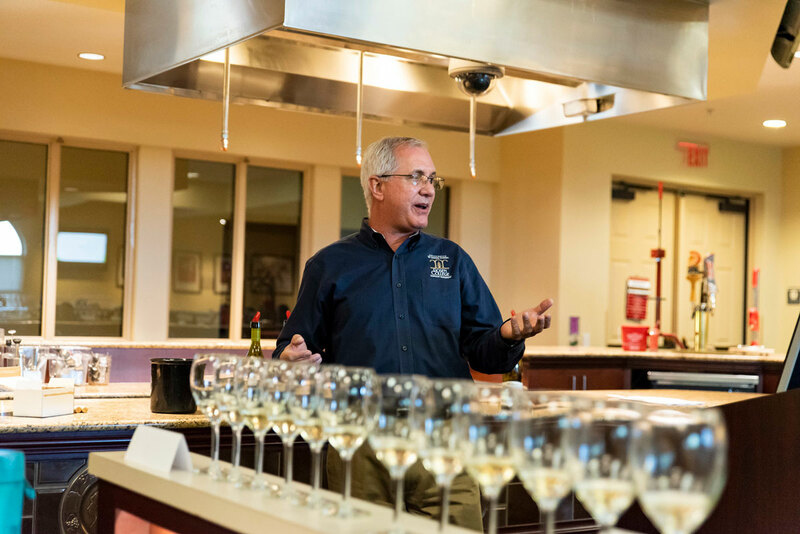 Why offer an entire class dedicated to wine? I grew up in a wine-producing family in South Africa. My family has been making wine for four generations. I grew up with wine in my blood, both literally and figuratively. 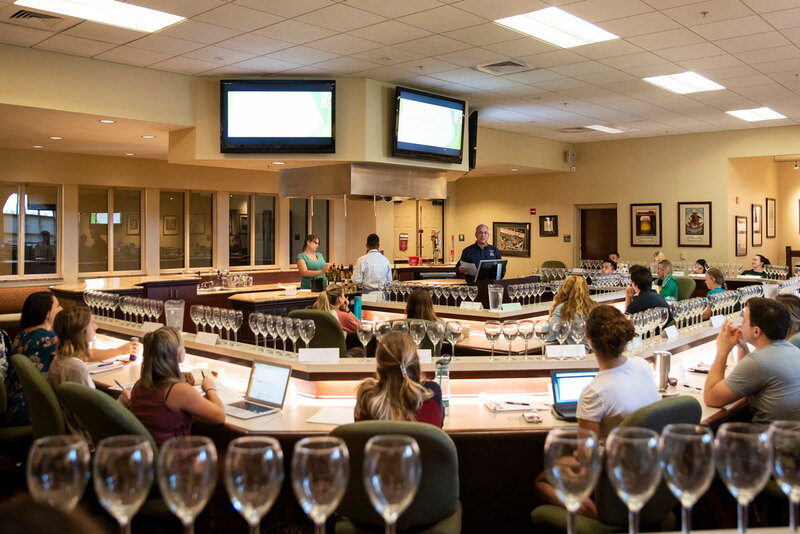 I used to do a lot of wine trainings and seminars, and for a time I taught wine schools at Epcot’s International Food & Wine Festival. I really enjoyed the educational side of my work, and I saw teaching wine courses as a huge opportunity. It really can be a useful life skill. What’s very gratifying to me is that I usually start each semester with 50 wine novices sitting in front of me and by the end of semester, I have 50 wine geeks who can pick up a glass of wine and taste it and evaluate it using the correct terminology to describe it. A number of them go on to take the first level of the Court of Master Sommeliers (wine expert and qualified taster) exam. This course prepares them very well for that. What should students expect to learn? The curriculum is meant to teach students about how wine is made, where it’s made and what makes one bottle of wine taste different to another based on where it’s grown, which grape varieties are used and the wine-making technique. They also learn how to successfully pair wine with food and what happens when you get those pairings wrong. I asked a business student once, why are you taking this course? And he said, “I’m taking this because I intend to be very successful in business. If I’m going to be successful, I’m going to have to entertain clients, probably at high-end restaurants. I want to be able to sit down, pick up a wine list, read it intelligently, understand what I’m reading and know which wines to order to go with the food that my guests are ordering because I think that’s going to impress people.” I thought this was a really great answer. I always use food as an analogy. We may go to the restaurant and order the same dish. I love it; you hate it. It’s the same dish, the same ingredients, but there may be ingredients in there that one of us likes and the other doesn’t. It doesn’t make it good or bad — it’s just about different tastes. What makes each wine region special? It’s what we call “terroir” in wine speak, which is a French term but there is no English equivalent. It basically means the “somewhere-ness” of a particular vineyard site. What do I mean by somewhere-ness? It’s the type of soil, the amount of sunshine that it gets, the slope of the land, any shadows from mountains, the amount of rainfall, the amount of wind — all of these factors come together to make every growing site unique. Red wine should be stored at room temperature, right? All wine should be stored at around 55 degrees. For drinking purposes, we want our white wines at around 45 degrees and our red wines at around 65. We don’t want them ice cold, as if they’re in a refrigerator. I have this battle at restaurants in Florida all the time where I order red wine and it’s warm. I ask for an ice bucket and they look at me like, don’t you know that you don’t chill red wine? Yes, but room temperature doesn’t mean that it should be warm. Cork or screw cap — Is one top better than the other? It really depends on the wine. New Zealand was the first country to start using screw caps for quality wines that are not usually aged. It’s not just any old screw cap, like you would find on a bottle of Coca Cola. It’s a screw cap specially developed for wine with a little rubber seal that works to keep the wine fresh. Most wines these days are not meant to be aged for 10, 20, 30 years. We’re often going to go to the grocery store to buy a bottle of relatively inexpensive wine to have with dinner tonight. The screw cap is going to give you the taste that the winemaker intended. On the other side of the coin, you do have wines that you want to age for a while. One of the problems with the screw cap is it can act almost like a time capsule. The wine doesn’t develop as quickly as you may like it to develop. A cork will allow microscopic amounts of air in and allow the wine to develop and age. I believe cork is still the best and most appropriate closure for wines that you want to develop in the bottle, although there will be those who disagree with me on this. What I thoroughly dislike are those plastic “corks” that you sometimes get on inexpensive wines. Plastic doesn’t expand and contract at the same rate as glass and cork does. You often end up with an oxidized wine because as the bottle expands, the plastic closure doesn’t. It lets air in, and you have a spoiled wine. What is the proper drinking technique? When you taste wine, you never fill the glass because you want to be able to swirl it to get some air into the wine to release the aromas.You want a large enough glass that a normal size pour is only going fill a quarter to a third of the glass to enable you to swirl it without spilling it. You want the opening to be large enough that when you take a sip, you’re sticking your nose into the glass so you can smell it because most of what we taste is linked to our sense of smell. You should hold it by the stem so you don’t warm up the wine with your hand, unless you want to heat it up, such as in the case of a red wine that is too cold. Although I don’t have a favorite wine, if I was stuck on a desert island and I could only take one wine with me, it would be a Pinot Noir. In all probability, one from either Burgundy in France or Oregon, which are the two parts of the world where they make my favorite Pinot Noirs. Why Pinot Noir? It’s delicious. It has complexity. It has a lot of flavor. But it’s also a fairly light-bodied red wine. It’s going to go with your richer dishes and your lighter dishes. It’s very versatile. What sets UCF’s courses apart from other colleges? We teach our students about hospitality in a hospitality environment. When you arrive on the Rosen campus, it doesn’t feel like you’re at a college. It feels like you’re at a resort, and that’s intentional. The size and scale allow us to have a much broader offering of courses. We’re so fortunate to have this amazing beverage lab. Most colleges would just use a classroom of some kind, but this room is dedicated to our beverage courses. We have a climate-controlled wine cellar. We have a walk-in refrigerator and storage for our spirits. We have a dishwasher and use real, proper-size wine glasses rather than plastic in order to give our students the best experience possible. Why did you enroll in this course? Right now, I work at a hotel. They have a lot of events, whether it’s corporate or weddings or family events, and they do a lot with food and beverage. You need to know what’s going on with the menu because food and wine is the biggest part of your event. I’m also taking the Fine Spirits Management course this semester. That way, when I’m speaking to clients, they know I have knowledge of the subject. Most challenging part of the class? The tasting part is iffy. You smell it first, and he asks your opinion. I’ve never really had wine or tasted it or smelled it before, so to me, everything smells the same, tastes the same. I can’t distinguish just quite yet. We’ve just done white wines so far. Maybe when we start red wines I’ll be able to tell a bit more. What’s been the most useful lesson so far? 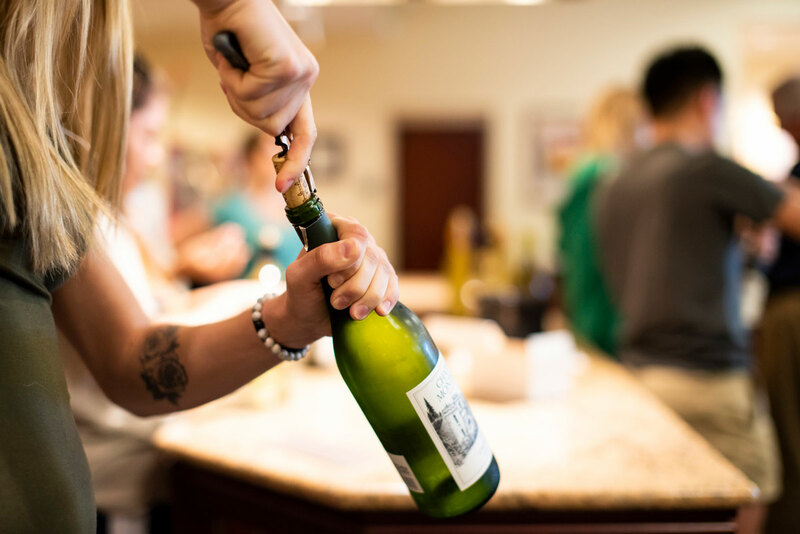 We’ve already worked on how to open a bottle professionally at a restaurant. I was a hot mess. Before we attempted, we watched videos and he also demonstrated for us — it made it look so easy. But when you’re doing it yourself, you have to hold the bottle up, which is a little heavy, and then getting the cork out is a situation. You have to really practice to get it in a real setting like a restaurant when you’re in front of people and it’s more nerve-racking. Part of the class you enjoy the most? I like that we get the tasting, rather than just reading our text book and coming to class and listening to the lecture. We get real-life experience. And it’s not just local wines. It’s wines from around the world. It’s a great opportunity to get a well-rounded education. Registration for HFT 4866C – Exploring Wines of the World is closed for Fall 2018 semester, but four sessions of the course are expected to be offered on Mondays, Wednesdays and Fridays in Spring 2019.